Extreme Dog Fence DIY Inground Fence provides different types of package. Choose your package according to your needs. Extreme dog fence system are installed for two reasons: firstly, to keep your dog within a specific area, and secondly, to prevent other animals (whether domestic or wild) from encroaching. Everyone who owns a pet is familiar with the risk that faces their dog when it goes roaming aimlessly without any supervision. It brings joy to every owner to see their dog running free without hindrance and that is why most owners take their dogs to the park. So, it comes down to a matter of balancing between pet fulfillment and pet security both which are very crucial. An extreme dog fence system makes both of these needs attainable and at the same time providing a cheaper solution compared to other Dog fencing methods. Read on as I take you through a detailed review of this cutting edge technology that has become a favorite for many pet owners around the globe. 1 Whom is Extreme Dog Fence System Suitable for? 2.7 Lighting and Surge protector. Whom is Extreme Dog Fence System Suitable for? For Dog owners who need Very High Quality Inground Dog fence. 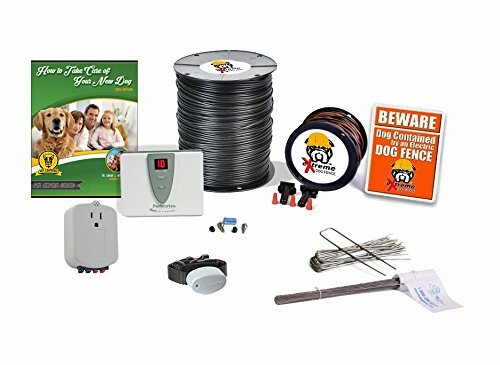 What's Included with Extreme Dog fence System! This feature will ensure that you will always be able to track your dog, wherever he or she is. The best collars will be lightweight, approximately 1.1 oz., so will be comfortable and not restrictive, and should also have a varying correction level. It is also possible to buy different size collars, depending on the size of your dog, rather than having a one-size fits all. Collars can be made of different materials, though rubber ones are often recommended as they will be softest on the dog’s neck. The collar will have contact points resting on the underside of the neck. Should the dog stray beyond the boundary set by the transmitter, he will receive an electronic stimulation. In this way he will soon learn how far he can go. This is also sometimes known as the Control Box as it is the main point of control for the entire system. It creates the signal which runs through the wires, and in this way creates the boundary which your pet will learn to stay in. The most sophisticated systems will also have lights indicating that the box is working properly, if there has been a break in the wire, and show the collar battery levels. To install it outside you will need a weather-proof dog fence transmitter box. These work by burying wires in your garden or field to set the boundaries for your pet. It can be created to a perimeter of any shape, and can have exclusion zones set up within it. The wires don’t even have to be put deep within the ground, just under the surface, and can run through streams. Certain selected systems can be set to up to 25 acres. The market leaders can even allow you to create different areas for up to five dogs, so each can have their own space. As the wires are underground, they will not require planning permission, whereas you might need permission for a high fence, especially if it is visible to others. This wire is made with the best technology in the USA to ensure it is durable and reliable. It is coated with a thick polyethylene jacket to protect it from corrosion, underground moisture and other elements that may cause it to be faulty. It is however recommended that if you are using a trencher to install, thicker wire will be a default requirement this is because of the amount of tension used when laying the wire. It is also important to first test the wire before installation as it is of no essence digging in a wire into the ground only to realize later that it is broken. The wire can vary from 500 ft to 1500ft and is capable of handling a total of 8 acres of land. To cover five acres, at least 50 flags will be used. The flags come in handy as they play a key role; first in ensuring the durability of the invisible fence and second as a visible mark to enable easier boundary learning for your pet. The flags are made to be easily visible from far and are made from PVC to prevent them from tearing. They are also customized with a metal shaft to allow easy insertion into the soil. Which other best kit to use than the direct bury splice kit to install the underground fence and hold the wires in place. They are the best choice when it comes to moisture seal two or more conductors. They also reduce wastage or the case of using too little sealant because once the insulator tube is pre-filled the laying of the wires can be done quickly. If your house or underground boundary wire is struck by lightning, you need to be sure that your extreme dog fence system is safe. If it is not protected, your boundary cable could be struck and thus the strike could actually enter your home. In extreme cases this could result in your property burning down. Surge protection, both internally and externally, should be a must when considering which fencing to use. If you are using the extreme dog fence system for more than one dog, you may want to consider having differing power levels depending on the nature of the dog. Some will learn very quickly how far their boundary extends. Others will need to have more training. By having varying power levels, you can ensure that the level is tailored perfectly for each dog. This will also take account of the size of the animal. A training DVD and an installation manual are also provided to show the user how to go about the whole process of fencing the compound and training your dogs to respect the boundaries with the least amount of pain inflicted upon them. If you have a dog who is liable to dig his way out of your garden, and you don’t want to build a high fence or keep him in a pen, then this Extreme dog fence system could well be the perfect solution for you.